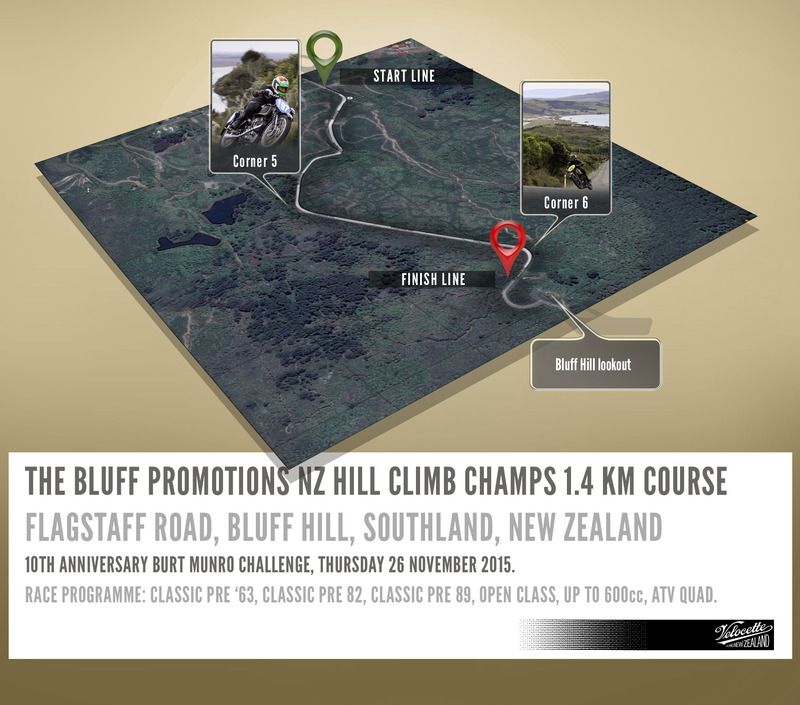 Kicking off proceedings on Thursday 26th November at the Burt Munro Challenge 2015 was the Bluff Promotions NZ National Hill Climb champs. The VRNZ Classic Velos competed in the Pre ‘63 (with girder forks) Class along with Neville Mickleson’s KTT, Rudges, a Triumph, an Indian and other famous marques pictured in the galleries below. Several riders from the VRNZ camp also raced machines in the Classic Pre ‘63 class, and the Post Classic Pre ‘72 class, galleries of those classes at the event are soon to be added. Flagstaff Road is a steep 1.4 km public road that snakes its way up Bluff Hill. With a few short straights, tortuous curves flanked by rocky cliffs, steep drops and demanding surface conditions that includes a small stream running across the exit of corner four the Bluff Hill course was a formidable challenge with which to kick off the start of a decade of the Burt. The map of the Bluff Hill course with the four photography locations marked. After the Marshall’s briefing, Machine Scrutineering and Riders’ Meeting the Hill Climb event started at 09:40 Thursday morning with a series of two practice runs up the tortuous course for each competitor before competition commenced. Competition consisted of a couple of official timed runs for competitors in each class entered. Bill Biber aboard the 1934 “Big Velo” 500 rounds corner 5 on his first timed run up Flagstaff Hill. Phil Price rounds Corner 5, in the 2015 Burt Munro NZ Hill Climb Champs.